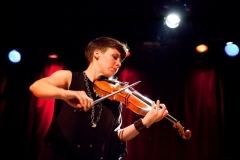 You may not have heard of Sarah Neufeld, a Montréal-based violinist and composer, but you’ve probably heard her violin (and other instruments) on any of Arcade Fire’s records, including including the The Suburbs, which took home the Grammy for album of the year in 2011. 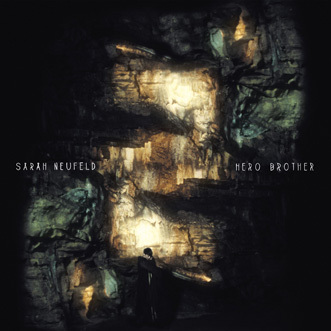 Stepping away from the Arcade Fire ensemble, Neufeld will release her first solo album, Hero Brother, on Constellation later this month. There’s something exciting and underdoggish about a backup musician moving to center stage. In some ways, I expected Hero Brother to sound orchestral with lots of strings or like another Arcade Fire record with their trademark (and somewhat tired) baroque-rock aesthetic. 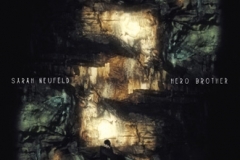 Instead, Neufeld has created a stripped-down album that combines highly textured violin melodies with light accompaniment from piano, harmonium, and wordless vocalizations. Neufeld makes full use of the violin’s range of squeaks, squeals, growls, and plucks, and the result is a devilish sound accented with light atmospherics to make the songs feel at once tightly contained and strangely spacious. This willingness to explore an instrument she’s already mastered is highpoint of the record. Though some tracks like “Tower” and “You Are the Field” offer an enchanting, dreamlike character, the stand-out numbers, such as the title track and “Wrong Thought,” work by oscillating between splendor and ferocity. Neufeld doesn’t so much court as she spellbinds. Of course, the great thing about music like this is that it’s a little unclassifiable. In a year of blockbuster releases from the likes of Daft Punk, Jay-Z, Justin Timberlake, and Kayne West, Hero Brother is certain to be overshadowed and possibly forgotten come year’s end. And while that’s unfortunate, it’s good to have a record like this now. Hero Brother, unlike Yeezus or Timberlake’s long-winded pop tunes, finds charm in its simplicity. The Fiddleback: How long have you wanted to make a solo record? Did you write material over many years, or did it happen spontaneously? Sarah Neufeld: I’ve been working towards making a solo record for a few years, since composing a few solo pieces for films. For the past year and a half I’ve been working hard on a body of work. I didn’t know when a record was going to emerge from the working, but I stepped back last fall and saw the record I wanted to make. The Fiddleback: Most people know you through your work with Arcade Fire. How has working with a hugely successful indie rock band influenced the direction you took on Hero Brother and/or the way you perform as a solo artists vs. playing as part of a large ensemble? SN: All of our experiences shape us. The past ten years of playing in Arcade Fire and Bell Orchestre has informed my identity as a musician for sure. To write on my own was something I felt really moved to do, and it was a new way of working for me. It was exciting, the feeling of inventing something entirely new. At the same time I’ve learned so much from my collaborators over the years, and have had so many incredible experiences; those experiences translate through everything I do. The Fiddleback: You recorded Hero Brother in different locations around Berlin, including an underground parking garage and an abandoned geodesic dome in order to capture different, site-specific acoustics for the recording. What was that process like? Did the acoustics of location affect the arrangements? I always thought of the instrument as an extension of my voice and wanted to explore the possibilities of expression within it. SN: The acoustics of each space definitely informed how I approached the pieces, especially in the dome. There is extremely long natural reverb, a noise floor of echoing wind, the sound of dripping water, and the recording happened in total darkness and very quickly. I recorded only sparse passages and vocals there, and those sections ended up slowing down dramatically, to allow the ambience to fully sink in. This lent those pieces more patience than I would have given them intuitively, and in that way I learned a lot about listening. The Fiddleback: You have a very idiosyncratic way of playing the violin that relies on merging interesting melodic repetitions with textures created by squeaking and squealing the strings. How did you develop the style? Were you classically trained? SN: I was classically trained until my teens, and then went on to play guitar and to later study jazz, electro-acoustics and composition. Through that road I committed again to the violin in a way that brought my whole self into it. I always thought of the instrument as an extension of my voice and wanted to explore the possibilities of expression within it. I suppose I’ve been working on that voice intentionally for the past ten years, but that inclination was always there. The Fiddleback: Some of tracks sound like they have ties to early Romani music (derogatorily known as “gypsy music”). Were you inspired by Eastern European folk music when making Hero Brother? SN: I love Romani music. I wasn’t specifically writing with it in mind, but it was definitely part of the multi-genre’d mash up I grew up with. The Fiddleback: The title Hero Brother comes from the second track on the record. Why did you choose it for the album title? SN: Hero Brother refers to an archetypal warrior character I have in my head, but it also captures a fierceness and solidity I wanted to give to the record as a whole. The Fiddleback: I saw you perform at La Poisson Rouge with Colin Stetson and Rafiq Bhatia. You opened the show and performed an amazing set that would be tough to follow. I’m curious to know if—and this is one of those chicken/egg, form/content questions—does your playing style affect the way you write, or does the music you write demand a certain performance? SN: My playing style informed the way I wrote in this project. The idea behind making a body of solo violin music was partly to give focus to the exploration of that voice and to draw a whole world out of it. The Fiddleback: Can we expect more solo records in the future? Seated photographs by Brantley Guitierrez. Header and action images by Susan Moss.